Don’t let their French name put you off! 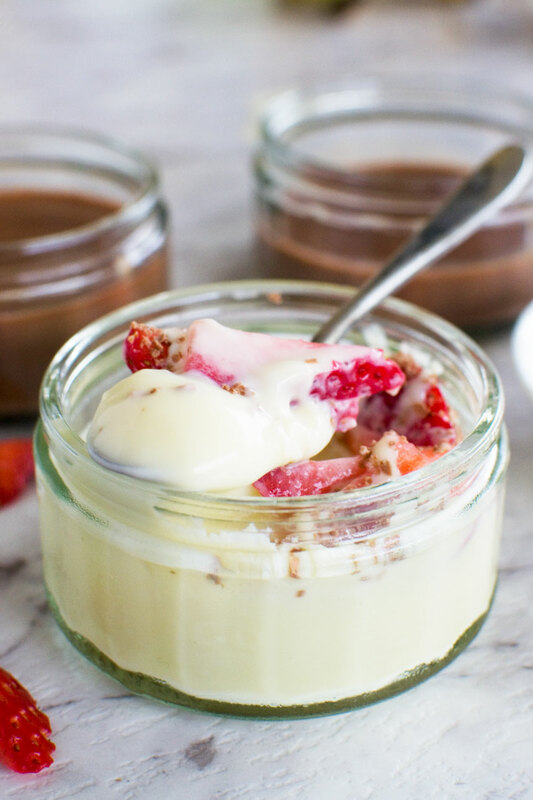 They aren’t fancy but these white chocolate pots de crème taste rich, decadent and delicious. Your guests will never guess they only took you 5 minutes and 3 ingredients to make! 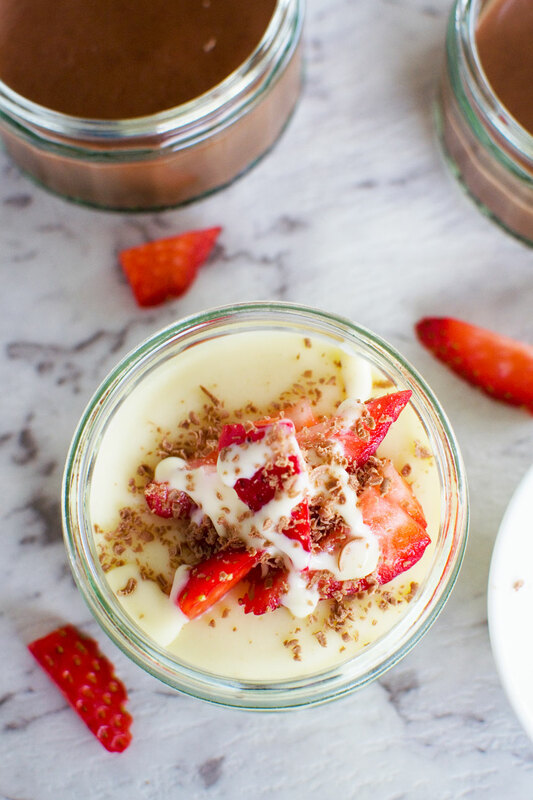 Make ahead dessert recipes like these white chocolate pots de crème are GOLD when you’ve got guests coming over. I’ve mentioned before (most probably many times!) that I’m not a fan of cooking and talking to guests at the same time. Saucepans bubble over and my words get all muddled up as I flap around the kitchen trying to finish off the cooking and be a good host at the same time. I can’t blame this on baby brain any more. I’m obviously just not a very good multitasker. So 9 times out of 10 when entertaining at home I opt for dishes I can make ahead. 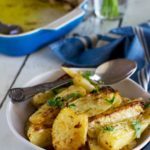 Personal fail-safes include my Greek chicken and potatoes or easy moussaka – both served with a traditional Greek salad, of course! 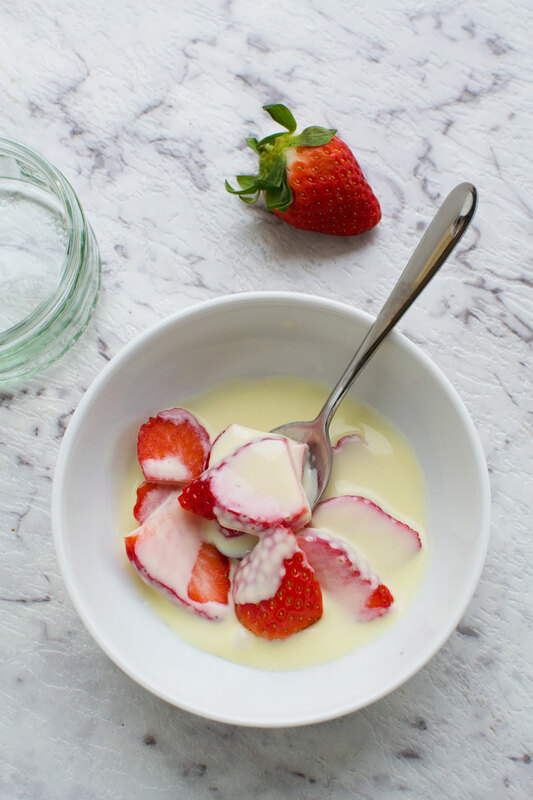 Many times lately dessert is these 5-minute white chocolate pots de crème, perhaps served with some berries and shortbread on the side. They always go down well. They taste rich, and smooth, and decadent – like something you’ve spent a lot of time making. But in actual fact, you’ve spent just FIVE minutes making them, and you’ve used just THREE ingredients. 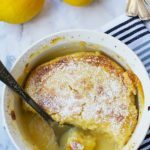 What are pots de crème? 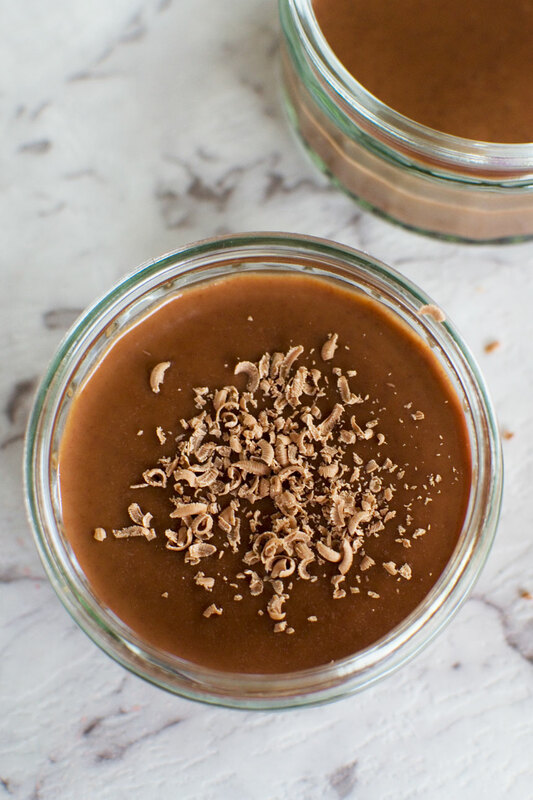 If you search for photos of pots de crème, you’ll find that most of them look like a simple chocolate dessert or pudding that’s about the consistency of a custard, or maybe a ganache. When you check out the ingredients though you’ll see that they can vary quite a lot from recipe to recipe. Most recipes contain eggs and sugar, and the steps involve what I’d describe as a bit of time consuming messing around! 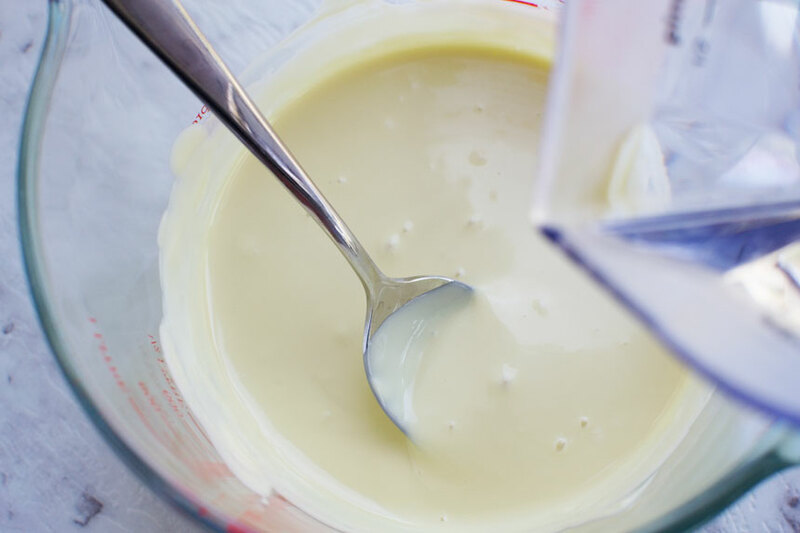 This white chocolate pots de crème recipe however contain NO eggs and NO sugar (although there’s plenty of sugar in the chocolate, of course). They are so simple that they contain just THREE ingredients (TWO if you don’t count the water). So aren’t these just the same as milk chocolate pots de crème… but with white chocolate? As my original 5-minute chocolate pots have been popular here on the blog, I thought I’d try making a white chocolate version. I know what you’re thinking. Don’t you just replace the milk chocolate with white? Trust me, I tried it, and the result was far too runny. It was still delicious poured over strawberries, but it was more like a white chocolate flavoured cream than a pudding-like dessert. 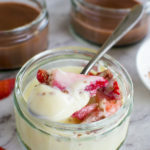 White chocolate doesn’t set in the same way as milk chocolate does, so I’ve experimented a bit with these white chocolate pots to get them as perfect as the milk chocolate ones are. 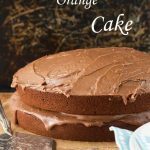 The recipe is very similar and still involves the same few simple steps, you just add less liquid to the chocolate to get the consistency right. How do you make pots de crème? Well, usually with eggs and sugar, so strictly speaking these aren’t pots de crème – at least in the traditional sense. You could argue that they should be called chocolate pots. I did consider this (my original milk chocolate version are called chocolate pots) but in the end decided to live dangerously and go a bit fancier. 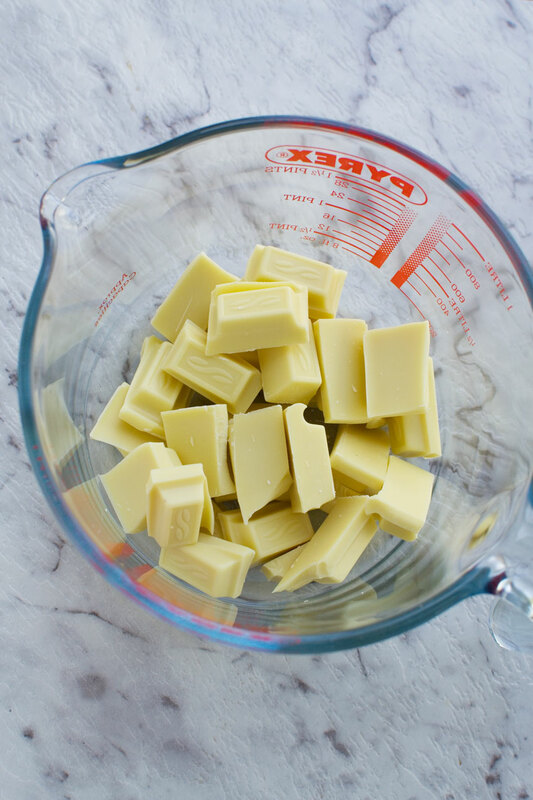 Melt white chocolate in microwave (I find 90 seconds is about right). Slowly whisk in some boiling water, then some double/heavy cream. Pour into ramekins or dessert glasses, cover and pop in the fridge to set. Just a warning that you will find that the results vary a bit depending on what type of chocolate you use. I find the consistency of the finished dessert is a bit different each time I make it. It’s always delicious though, so it really doesn’t matter too much. As a general rule, make sure you use double / heavy cream and use the best quality chocolate you can find. If you’re in Australia, thickened cream works too. You’ll find though that the chocolate pots end up a bit thicker as there’s a bit of gelatine in thickened cream. 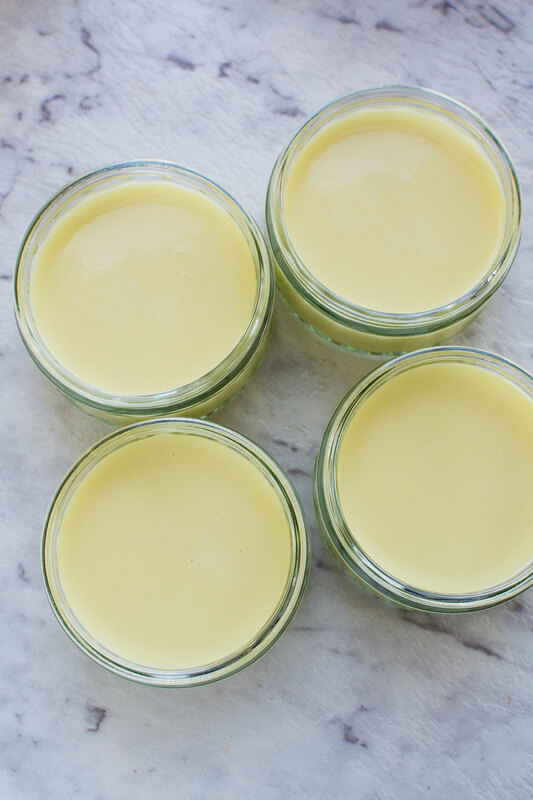 How should I serve my white chocolate pots de crème? I like to serve my pots de crème (either white or milk) with strawberries or raspberries, and a piece of good quality shortbread. If you like you could even put some berries in the bottom of the ramekin before topping with the white chocolate cream. Mmmm! I’ve also tried making milk and white pots de crème, which are especially pretty and delicious. 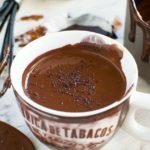 Simply use my original 5-minute chocolate pots recipe to make the milk chocolate version (halve the recipe), pop in the fridge to set for about an hour, then pour some of the white chocolate mixture on the top. 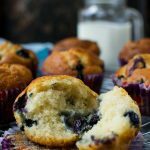 Pop back in the fridge until your guests arrive! I tried this and forgot to take photos, but scroll down to watch the video below the recipe to see me make it this way! Don’t forget to scroll down to the recipe to watch the handy how-to video! Any small ramekins you have works really well for this recipe, but you can also use espresso cups or mini dessert glasses. Although I don’t personally own them, I quite like the idea of this bowl/ramekin set. You can use them for desserts like these, or use them as dipping bowls! I also like to use a glass Pyrex jug to make this recipe. This way it’s really easy to pour the chocolate mixture into your ramekins / dishes. Every kitchen needs one of these! 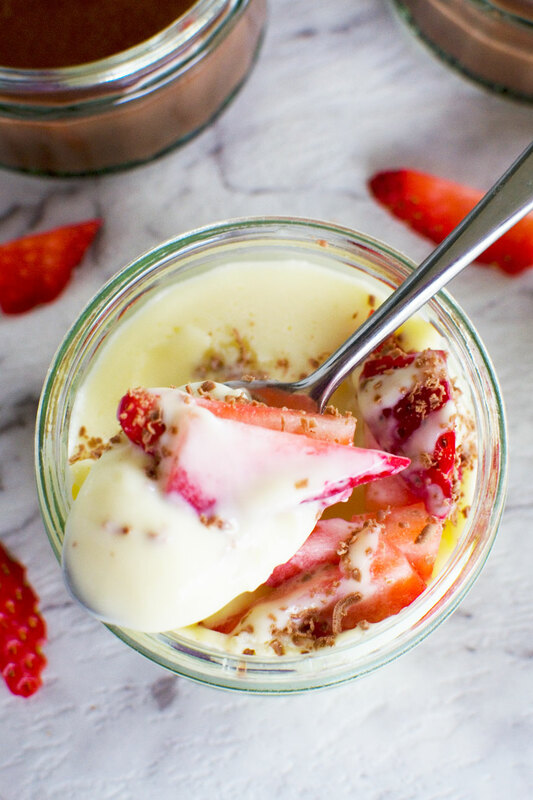 These 5-minute white chocolate pots de crème are the BEST super quick make ahead dessert. They contain just 3 ingredients – white chocolate, water, and double cream, and really do take just 5 minutes to make! Add a few berries and some shortbread for a classy low maintenance dessert that impresses every time. Break up the chocolate into a microwave-safe jug and melt it in the microwave in 30 second bursts (I find 90 seconds is about right). Slowly add the boiling water, stirring continuously. Pour the mixture into 4 ramekins, espresso cups or small dessert glasses. Cover with plastic wrap and refrigerate until you’re ready to serve (at least a couple of hours). Serve with grated milk chocolate, berries and shortbread if you like. The chocolate mixture may go horrible and stiff when you first start adding the water. 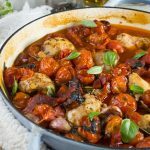 No problem – just keep adding and stirring! You may find that your chocolate pots vary a bit each time you make them depending on what type of chocolate you use. It doesn’t matter – they’re always delicious! 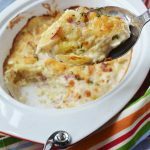 Thickened cream works too. You might just find that your desserts end up thicker because of the little bit of gelatine in thickened cream. 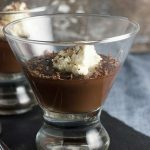 If you decide to make these with either milk or dark chocolate, use my original 5-minute chocolate pots recipe instead of this recipe. 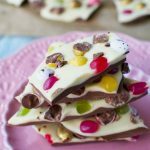 The amount of each ingredient is a bit different as milk and dark chocolate sets differently to white chocolate. You can even make chocolate pots with a layer of white chocolate and a layer of milk or dark. These will take slightly longer to make of course, but they’re REALLY delicious and in my opinion worth the extra effort! You may want to take your desserts out of the fridge an hour or two before serving so that you can serve them at room temperature. They’ll still be set nicely but won’t be so cold – totally up to you! These were so easy to make, I’ll definitely be making them again! Hi Jillian! I’m so glad you enjoyed them! 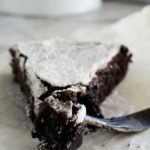 These and my original milk chocolate recipe are my go-to entertaining desserts! I can’t wait to try your recipe. They’re so creamy and delicious looking!! Thanks Renee. I hope you enjoy them!